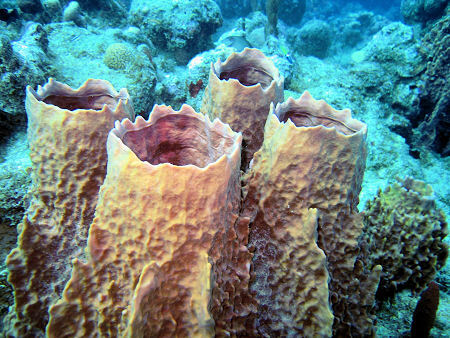 Like their tropical counterparts, cold water corals provide a habitat for a myriad of marine life. These hotspots of deep sea biodiversity have only become known to us in the last ten years. Like pearls on a necklace, reefs of cold water corals extend along the eastern margin of the Atlantic Ocean over a length of 5000 kilometers, from northern Norway to the African coast. As we glide over the reefs admiring their silent beauty, it is hard to imagine that these pristine ecosystems might soon be lost from our planet. Yet, if human carbon dioxide emissions continue to increase at present rates, corals in large expanses of the ocean will soon be living in seawater that corrodes their calcareous skeletons. The catch word for this process is ocean acidification: the pH value of seawater (a measure of its acidity) is steadily decreasing. Like osteoporosis in humans, the corals’ calcareous skeletons will dissolve faster than they can rebuild them. But how can such emissions endanger life in the ocean? The underlying process leading to ocean acidification is very simple, much simpler than the CO2-induced changes in our climate system. Its origin lies in the absorption of massive amounts of man-made CO2 by the surface ocean. Nearly half of the amount of the gas that has been released from fossil fuels through human activities since the beginning of the industrial revolution — over 500 billion tons of it — has been taken up by the ocean, as the largest habitat on our planet serves as its largest sink of greenhouse gases: in the long term, it is expected to absorb 90 per cent of all fossil fuel CO2 released into the atmosphere. The acidification of seawater will continue to creep into the deep ocean, even long after emissions dwindle or come to an end. It may be described as a blessing for our climate system because it dampens CO2-induced greenhouse warming — but it will prove to be a curse for marine life. When carbon dioxide dissolves in seawater it forms carbonic acid. Part of it is neutralized by the carbonate buffer, a chemical reaction that consumes carbonate ions — the building material used by calcifying organisms to produce their shells and skeletons. The remaining acid leads to a decrease in the pH of seawater. The lower the pH value, the greater the concentration of hydrogen ions and hence the more acidic the water. The ocean’s uptake of carbon dioxide from fossil fuels has already caused a pH decrease of 0.1 units, which corresponds to a 30 per cent increase in hydrogen ions. If current trends in CO2 emissions continue, seawater’s pH will decrease by about 0.45 units from pre-industrial times by 2100. This would be lower — and the rate of change faster — than has occurred for at least the past 400,000, and probably for the last 20 million, years. This will affect not only cold water corals, but calcifying organisms in general. As the concentration of carbonate ions diminishes, the production of calcareous structures will become increasingly difficult. All calcifying species so far tested in laboratory simulations show a decrease in calcification in response to ocean acidification. Calcification is a widespread phenomenon among many marine organisms, extending from corals to mussels, snails, sea stars and sea urchins, to tiny calcifying unicellular animals and plants at the base of the marine food web. Even fish precipitate calcium carbonate to build some of their internal structures, such as calcareous platelets in their vestibular apparatus. Judging from current experimental results, there is a high risk that many calcifying groups may lose their competitive fitness to prevail in an ocean of increasing acidity. The consequences this may have for the marine food web are presently unknown. Looking back in Earth´s history, we can learn a lesson from the fossil record. When a comet hit the Yucatan Peninsula in northern Mexico 65 million years ago, massive amounts of calcium sulphate were blasted into the atmosphere. There it reacted with oxygen and water to form sulphuric acid. The amounts of sulphuric acid were sufficient to make the surface ocean corrosive for the calcareous shells and skeletons of surface dwelling organisms. It probably only took a few years until mixing with deep ocean waters neutralized acidification at the surface, but it was long enough to cause the extinction of nearly all planktonic calcifiers. Two million years went by before corals reappeared in the fossil record. It took a further 20 million years for the species diversity of calcifying groups to recover to pre-extinction levels. Research on the effects of current ocean acidification is still in its infancy. No one knows how the negative responses observed experimentally on individual organisms will translate to communities and ecosystems. How will these responses be affected by other stress factors such as changing temperatures or the availability of nutrients? There is also a major challenge in determining the ability of sensitive organisms to adapt to ocean acidification. Despite much uncertainty, it is probably safe to say that continued ocean acidification will cause the loss of marine biodiversity, with presently unforeseeable consequences for marine ecosystems and food webs. In its 1995 report, the Intergovernmental Panel on Climate Change (IPCC) published a series of scenarios of projected CO2 emissions for the 21st century. Its worst case scenario was critically judged at that time as being far too pessimistic. But records over the past 10 years indicate that the actual trend in global CO2 emissions is above the one in this scenario. Despite rising awareness of the problems associated with increasing levels of atmospheric CO2, our efforts to turn this process around are still lagging behind. Ocean acidification and the associated risks to marine life provide yet another incentive to act quickly and decisively in order to reduce global emissions of carbon dioxide.